Oh, I am so vexed. Tell me, what color do you think of when you hear "sunshine"? I think of warm, mellow, golden yellow-- NOT neon highlighter yellow! 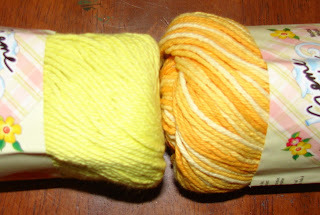 Well, if you are looking for a golden color do not order Creme de la Creme cotton in "sunshine". I learned the hard way that the tiny 100 pixel square thumbnail on the website does not, in any way, accurately depict the color. Try "goldtones" instead. It is a lovely varigated shade of warm golden hues. The picture does not really capture the chartreuse quality of the "sunshine". So, if you are looking for a neon color, try "sunshine" but if you want warm, rich, lovely color, try "goldtones". Oh, I'm sorry about the colors. That's why I like looking in the store. But sometimes buying online is nice and easy. I did receive your roll up hook case, THANK YOU. I hardly check my PO box. I put a formal thank you on my blog.